'The Dope Sheet' was the earliest Packer Official Program and Publication, produced from 1921 to 1924. They were printed on thin newspaper-like paper, and are extremely hard to find. Most Dope Sheets in excellent condition from 1921 to 1924 are valued in the $ 2,000 to $ 3,000 RETAIL range. The most valuable Dope Sheet would be for the big game of October 23, 1921 against the Minneapolis Marines at Hagemeister Park in Green Bay. This game is widely considered the Packers first professional football game. This Dope Sheet would be valued in the $ 5,000+ RETAIL range in excellent condition. 'The Dope Sheet', it's official name, included the Dope, meaning information and data, on the Packers and their current game opponent, as well as current information on other teams in the league. Dope Sheets were usually approx. 8 pages, and contained a lineup sheet and a good amount of local Green Bay advertising. 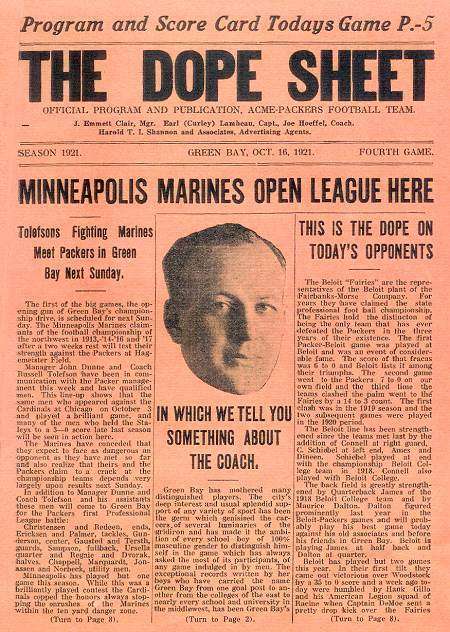 'The Dope Sheet' pictured below was for the game played on October 16, 1921 against the Beloit Fairies, just one week before the historic first game with the Minneapolis Marines on October 23, 1921. Look closely at the scan below and you will see who was listed as the head coach of the Acme-Packers Football Team. Earl (Curley) Lambeau, right? Wrong! Joe Hoeffel is listed as coach, with Curley being listed as Captain. George Whitney Calhoun, the sports editor of the Green Bay Press-Gazette, probably wrote the copy for the early Dope Sheets, proudly wielding his unusual, extra colorful writing style. Calhoun also provided great publicity for the early Packer teams.